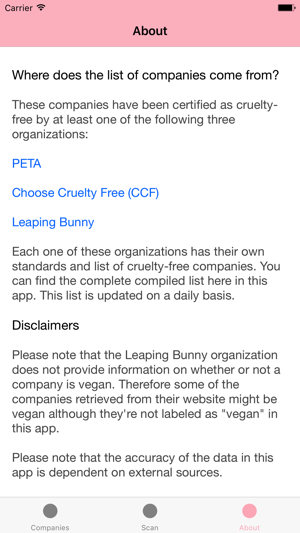 The Happy Bunny app provides a list of companies that are officially cruelty-free. 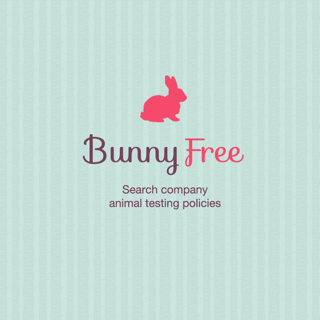 Gone are the days where you need to decrypt the "no animal testing" wording on a company's website. 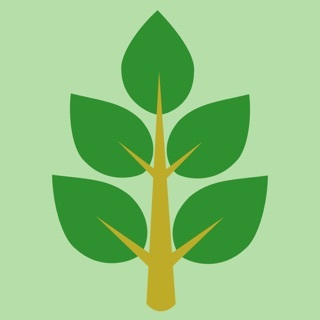 Need vegan products? We'll show you which companies are vegan. Heck, we'll even show you which organization each company was certified by. 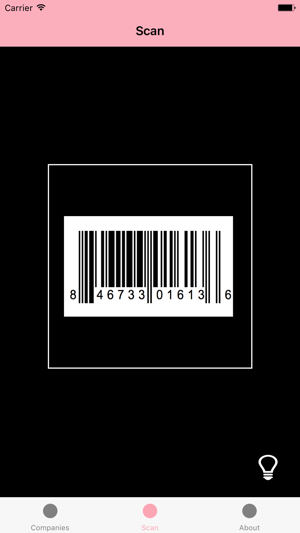 You can even scan product barcodes to find out if they're cruelty-free and shop for them right in the app. Magical. Happy shopping, you kind soul, you. We've all been waiting for this. Oh, you know. The thing that's about to make your life 5,983 times easier. • The product scanner is here. Bam. You can scan products and we'll tell you if they're certified cruelty-free. We even include a link to the product so you can find out more about it and purchase it, if you wish. So scan away, efficient butterfly. • Made the app even more user friendly by adding UI elements, including activity indicators to let you know some good stuff is loading. Also because they're pretty. • Lastly, some internal mumbo jumbo was updated to make sure the app works well with iOS 11. Because we all know you're installing it the second you get that software update notification. Mhmm. I’ve been looking for an app like this but it seems as though the data they have is wrong or incomplete. The first product I scanned was my DermaE face wash and it said that they couldn’t find it on their list which “Probably means they test on animals. Not cool.” When I know in fact that this company is 100% cruelty-free, vegan, gmo free and even eco-ethical. How do I know this? It says it right there plain as day on the bottle! It even shows the badge/logo that states all of this in the picture of the product that the app shows! 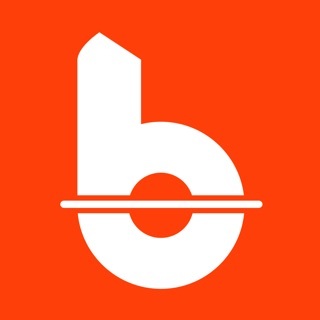 This app has potential but it’s sad that it could possibly misinform and deter customers away from brands that are actually great. 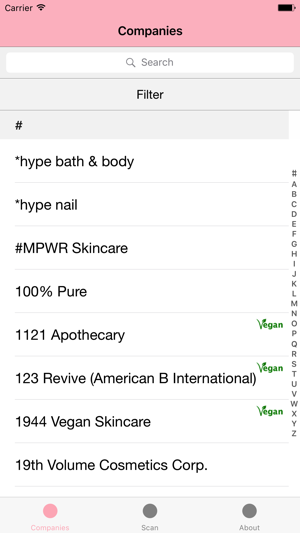 It also doesn’t have a feature to look up certain products from their brand list to see if they are vegan/cruelty free. For example, I tried to check my Kat Von D lipstick and you could only check that the company was cruelty-free. If you want to know anything past that you have to dig through the Kat Von D website which I could have done without this app and saved a step. I love this app. Exactly what I needed. It combines all of the cruelty free companies into one list. 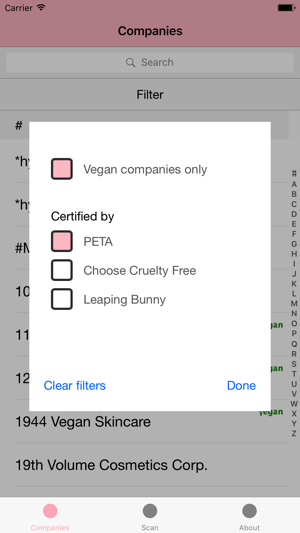 I used to have to check in all 3 apps made by the peta, etc but now I just check one and done. The scanner is useful too. I love how it will give you a link to buy the product ONLY if it’s cruelty free. Thank you! I'm trying out the new scanner, and I've scanned cruelty free products only to be told they're not on the cruelty free list. Okay, so maybe the product isn't, but the separate ingredients have been. I scanned Wet N Wild and was told it's not on the list, "Not cool." 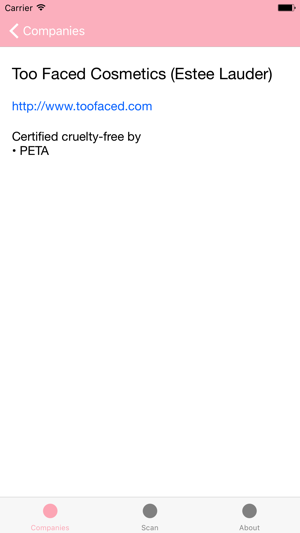 Go to the list of cruelty free, and look at that. Wet N Wild is right there. I don't want to miss out on good stuff because of an inaccurate app. "Not cool."